KT British Labs Why Are Labradors Such Good Hunting Dogs? Why Are Labradors Such Good Hunting Dogs? If you are currently looking for a good hunting dog, there’s no dog quite like the Labrador retriever. Hunters have relied on Labradors for generations, and continue to turn to them today for their hunting prowess. But what makes the lab such a great hunting companion? Let’s explore a few of the reasons Labradors excel as hunting dogs. Labradors love to play. Whether they’re at home or out in the field, they always seem to find extra energy to keep going. 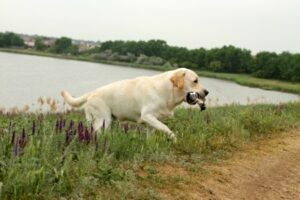 If you plan on using a lab for hunting purposes, you will obviously need to put their energetic nature to a productive use, but these dogs are full or energy which means you should never run into a problem with keeping a lab motivated. Labradors have been used for hunting for so long now that most of them are born with the natural instinct to hunt. That doesn’t mean that they don’t require some training to get their skills into check, but it does mean they will easily pick up the skills they need to work with you in the field. When you rain your lab, you’ll put their instincts to use in helping you out on the hunt. Training is one of the biggest parts of preparing a dog for hunting, but Labradors are highly adaptive to learning new skills and commands. A good hunting dog needs to know how to stay calm and follow your directions when you are hunting, heeling when you command and not roaming about and stirring up or scaring off game. Fortunately, they can be trained to do just about anything, and with practice, your pup will follow your lead in the field with ease. The earliest labs were bred for waterfowl hunting, and one of their best features is that their fur coats are known to repel water. That means when they go swimming after a bird in the water, they won’t stay wet for long, limiting their exposure to the wet and cold. They can swim out, retrieve your bird and return to land, quickly drying off and getting ready for your next target. KT British Labs specializes in preparing labrador puppies for hunting. If you are thinking about investing in a hunting dog, we’ve got healthy puppies that can help you succeed with your hunts. Call us at 218-685-5103 today and find out more about our currently available and upcoming puppy litters.